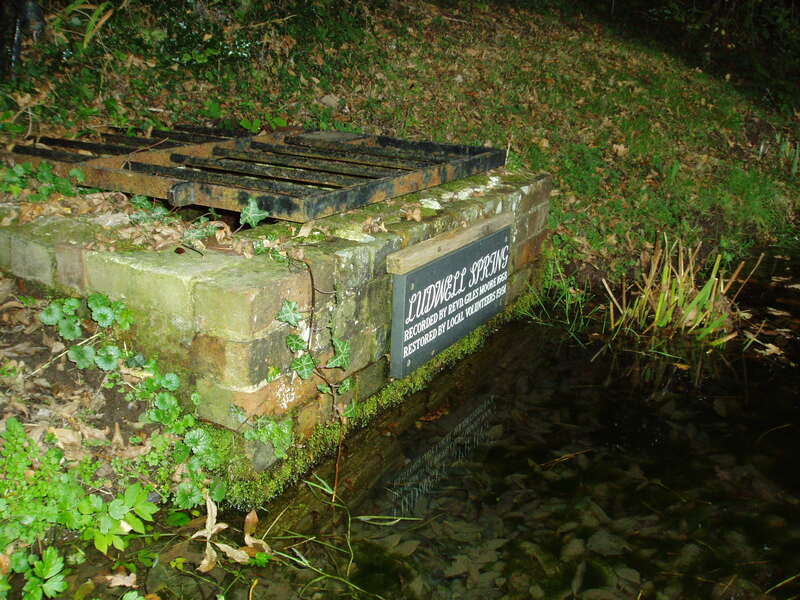 For many years, the only evidence of Eastbourne’s claim in sacred spring history was the area named Holywell, favourite of the retiree. However, since 20 the town has some real tangible evidence for a holy well, although whether the spring is the original holy well is open to debate. “one of the springs is called Holy-well, supposed to be so named from the many advantages received from drinking those waters”. “At Holywell there is a chalybeate spring, the curative properties of which have given the name of the Holy Well. However, a subsequent analysis of the water demonstrated that it had no particular ‘curative properties”. “the chalybeate springs at Holywell, a short distance west of the Sea House, are highly worth the attention of the visitor. The quality of the water is said intimately to resemble the far-famed springs at Clifton”. 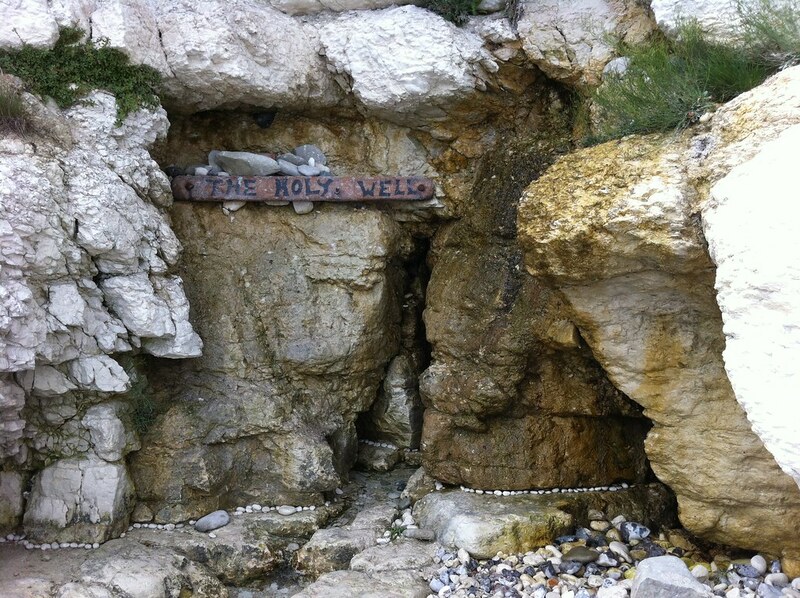 The well was apparently rediscovered in 2009 as a spring arising at the foot of the chalk cliff. A wooden sign has now been affixed as well as a cup and chain. Akyildiz (2011) notes in Landscape and Arts Network Articles – The rediscovery of a Fresh Water Spring beside the sea: a local holy well? He also notes that a local Catholic church has blessed this site twice and on each occasion has attracted a gathering of nearly 50-70 people and in 2014 there was an evening concert at the well with a New Age flavour, so it is good to see this local spring being embraced by its local community, whether is the titular spring is unclear however. It is my great pleasure to present an article from one of the most important contributors to the holy well research field. Author of the excellent The Living Stream – the first academic book on the subject, the indispensable guides to holy wells of Buckinghamshire, Kent and Surrey, as well as countless articles for Source and Living Spring, as well as his own webpage..he’s been in retirement holy well research wise and sticking to the day job of being a rector, so its a great privilege that he’s contributing this ground breaking piece of research about a holy well which is not recorded elsewhere to this blog.. In 1960 the Revd John Bickersteth, unlikely owner of the ancient seat of the Earls of Ashburnham in East Sussex after the death of his second cousin, created the Ashburnham Christian Trust. The estate, which Revd Bickersteth had only visited once before he inherited it in 1953, consisted of 8,500 acres of farmland and woods, a crumbling 82-room mansion filled with antiques, and a tax bill of £427,000. Most of the land and the treasures were quickly sold, but the house remained, inconvenient, expensive, and it seemed unlettable. However Revd Bickersteth was approached with the idea that Ashburnham Place might house a Christian training and conference centre. 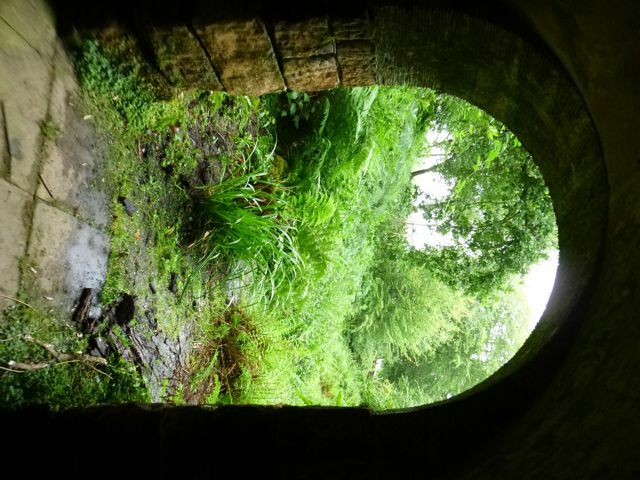 Most of the house was demolished, the grounds tidied up, the Trust established, and this is the role it fulfils today – along with a tea room open to ordinary members of the public, who can, provided they let Reception know, walk the grounds – and see the wells. The approach to Ashburnham brings the visitor along a swooping drive through Burrage Wood and across the gorgeous stone bridge of the 1820s spanning Capability Brown’s lake formed off the River Ashbourne, to park around the back of the house near the old parish church. As far as wells are concerned, the chief attraction lies just south of the Broad Water. The Ladyspring Grotto is approached by one of two routes up a short gully leading uphill from the edge of the lake: either a high path along the eastern edge, or a lower path along the bottom of the gully. The upper path curves in around the top of the gully past a collection of massive boulders and stone steps. In both cases the Grotto is more or less hidden from view almost until the visitor reaches it. It consists of a well-chamber about five feet square by seven feet high, set into the bank, with a flagged stone floor and plastered walls, and a semi-circular arched roof; the walls are of very substantial stone blocks and the arch is constructed from thin clay tiles. The water pours from an outlet in the back wall into a stone trough raised above the floor. Nothing is known for certain about the Ladyspring’s history. Information available at Ashburnham ascribes it to Capability Brown’s landscaping of the gardens in the 1760s and ‘70s, but if so it would be an item unique in his entire oeuvre. The only other folly in the grounds is a tiny Temple (really just a glorified seat) looking from the southwest bank of the lake across at the house. My guess is that, even though it may date from that sort of time, the real responsibility will have lain not with Brown but with the incumbent Earl who may have had a taste for that kind of thing. The Grotto seems to be an attempt to recreate a Graeco-Roman nymphaeum or shrine, with shades of the great spring at Bath (and rather like the site at Santa Fiora near Rome uncovered in 2009 – http://aqueducthunter.com/fiora/), and suggests a landowner who had some interest in and experience of such sites. John, the second Earl Ashburnham, who commissioned the landscaping work from Capability Brown, was, Horace Walpole described, ‘a decent, reserved and servile courtier’, and seems a less likely candidate than his son, the academically-inclined third Earl, George, who was a Fellow of the Society of Antiquaries and trustee of the British Museum. 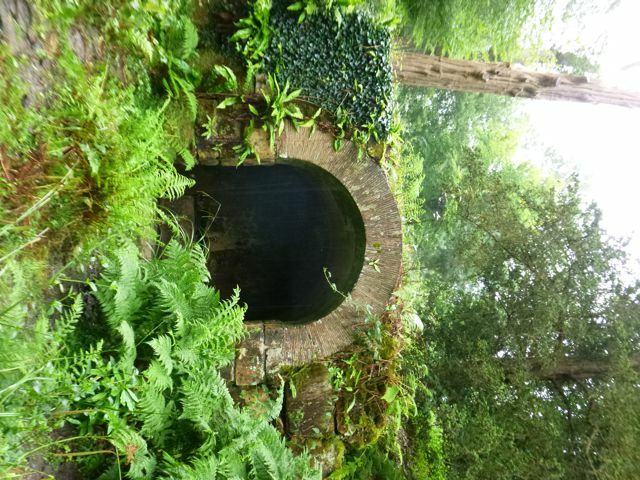 He was in charge of Ashburnham between 1812 and 1830 – a bit late for the sort of Romantic folly-making the Grotto represents, but George is still its most probable builder. The origin of the name is mysterious too. The Ashburnham Place guidebook and various information boards around the grounds ascribe it to a painting on the plaster at the rear of the well-chamber, depicting, as variously stated, one or three ‘ladies’. The image is supposed to be visible when water is thrown on the plaster – though, even allowing imagination the greatest latitude, I couldn’t make out anything more than random stains of mould – or under infra-red photography. An estate map of 1638 (thekeep.info/places/eastsussex/parishesandsettlements/Ashburnham) shows a ‘Lady’ field name to the north of the house, so the title had some pre-existing local usage, and a ‘Lady Spring’ might have existed before the creation of the Grotto, even if the name did not refer to the Virgin Mary (the church is dedicated to St Peter). 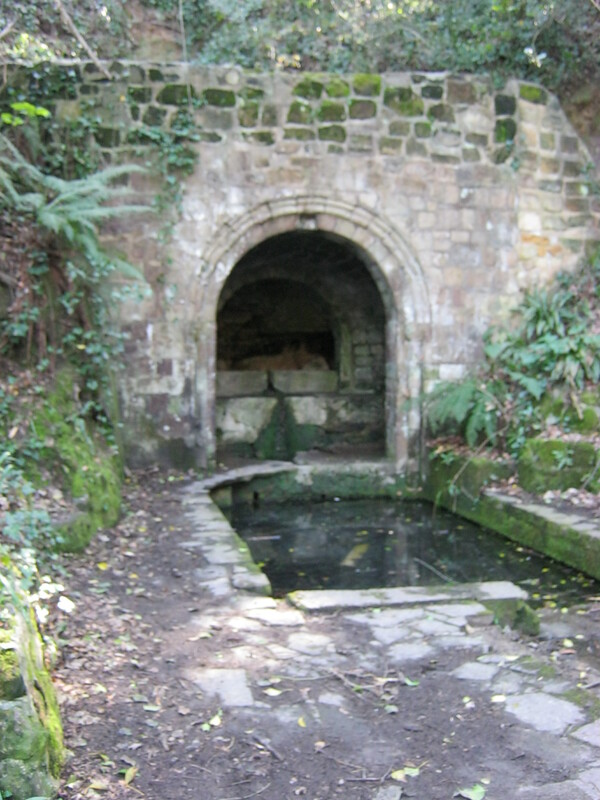 The Ladyspring is the most impressive of Ashburnham’s wells, but there are others. A couple of hundred yards to the southwest is Ironspring, a somewhat overgrown, artificially-dammed pond emptying into the lake and fed by waters which seep in from the slope above. The name suggests mineral content, but nothing is very obvious from the appearance of the water and there are no tell-tale red stains on the mud or undergrowth. Again, the history of this site is unclear: it isn’t named on old or current Ordnance Survey maps. The Palladian Fountain is harder to locate (I stumbled upon it by accident). It lies south of the carriage drive and seems to be more modern than the Ladyspring, dating to a later phase of the development of the gardens. The outlet is a metal pipe set into a recessed semi-circular arch about four feet high, dripping water into a trough edged with shaped, dark bricks. On the left-hand, eastward side of the fountain, a stone wall curves away, supplied with what appears to be a low bench although the ground is now a bit boggy for sitting and contemplating, as well as the surroundings being somewhat overgrown. The Fountain doesn’t in fact tap a spring, but the overflow from one of the rivulets feeding the lake. The pink stone Shell Fountain, lying in the grounds to the north (and now dry) dates to the 1850s when water was channelled from springs to feed the gardens around the Orangery, next to the house. The Ladyspring alone would justify a far greater fame for Ashburnham in hydrolatric terms. The combination of well-house and slightly tweaked and augmented topography creating a Romantic neo-pagan experience but one which aims at authenticity is unique in the UK and it would be fascinating to know more than just the speculations I’ve given here. My occasional visits to Sussex have allowed me to visit the ancient water supplies which have been poorly covered. I hope in the next year or so to publish my volume on both counties, until then I thought I’d inform you of my exploits in both East and West Sussex as a taster for the book. If any reader knows any site (other than St. Anne’s Well Brighton) please message me I’d like to know. What is interesting here is the name. Lud dedications can often be confusing. Some authorities without equivocation suggest they are dedicated to the Celtic God Lud, however often with springheads it is said to derived from loud, I have always included them in my research as the former and I think the second name is vindication…what God are they refereeing to? It seems unlikely that either people in the 1600s or modern people would instantly make or care about the link. So this seems likely to a Pagan survival. 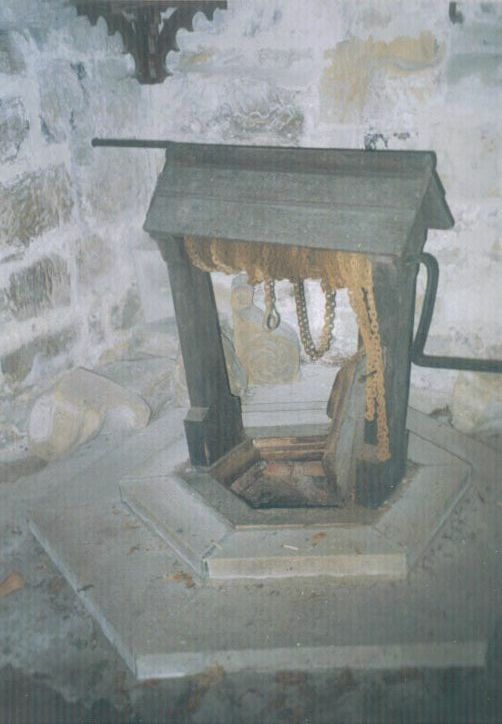 Perhaps the presence of the holy well is further evidence. Was this established by the Christians to avert interest…ironic that that site was chosen for the mains? The Ludwell had become very overgrown in recent years but today is a testament to what local people can do to tidy up and repair our water heritage. 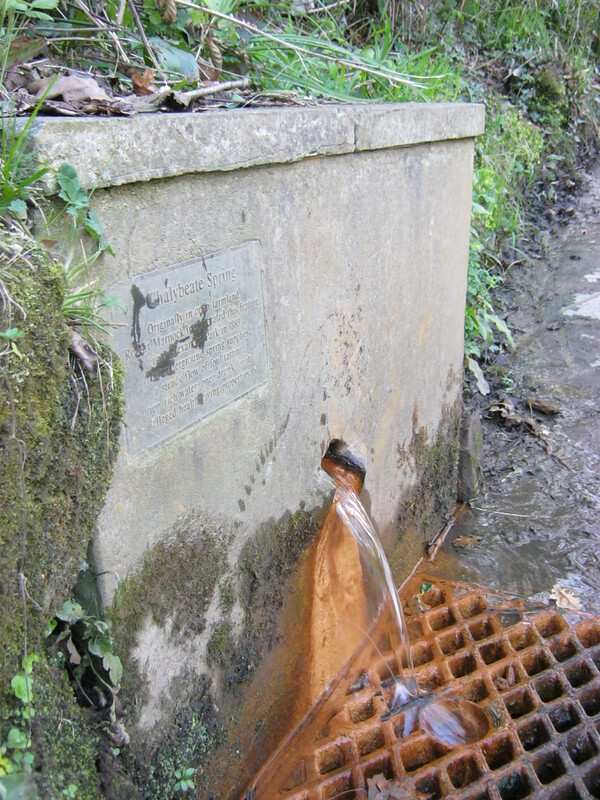 The springhead also flows to fill a trough closer to the road perhaps set up for animals. Interesting in his garden was a circular well, could this be a lost holy well? I only suggest this as the house abutting this property and sharing the same drive was called Holy Well. I was informed by the elderly owner of this house that it was covered by a square of concrete to prevent children falling in. The well house appears to be brick made and those which can be seen are very mossy. 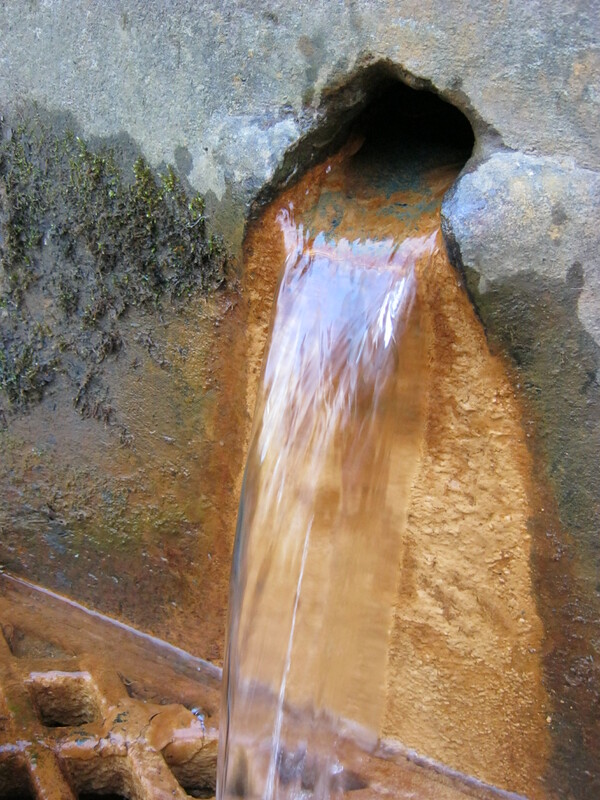 The spring still flows through a pipe into a channel below beside the road. Caught old Sathanas by ye nose. That he was heard three miles and more. The legend is well known, although the legend appears to have transferred to the Chalybeate Spring at Tunbridge. 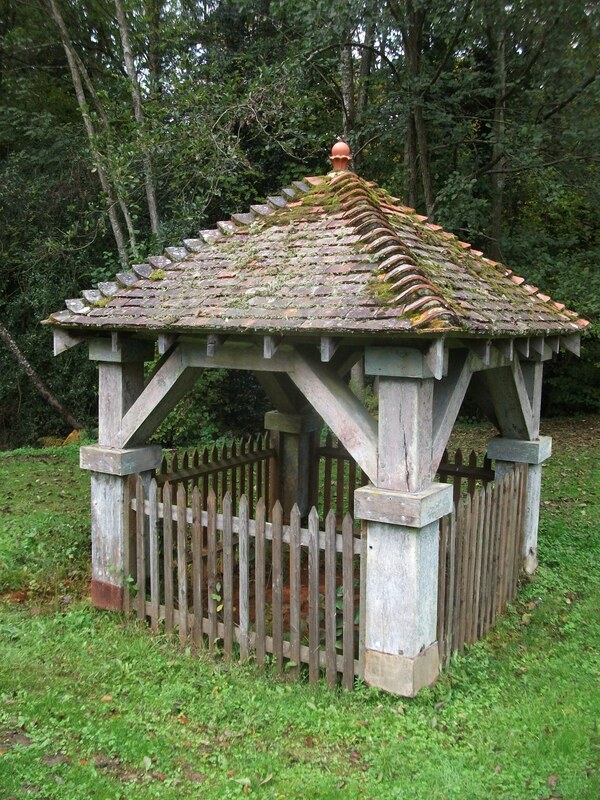 Here is a notable Chalybeate spring covered by a delightful 19th century wooden well house with four sturdy wooden posts and pyramidical tiled roof topped with a pineapple like finial. The centre of the well house is pleasantly tiled with large red tiles surrounding the spring which fills a circular basin. 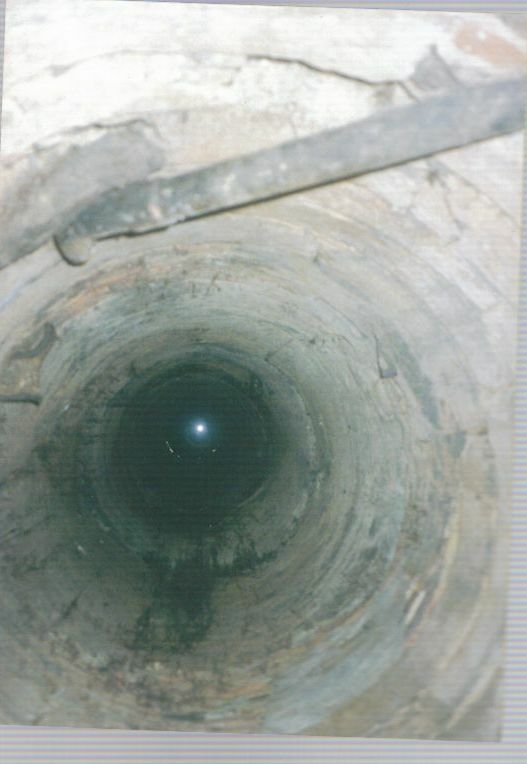 Its water appears to flow beneath the well house into a natural hole in the ground and then a further dipping hole, more detailed than the first resembling that seen at Tunbridge Wells, perhaps established as a 24 hour source as the main source was completely fenced off in the well house. The water is very heavily coated in orange scum, in fact it’s one of the strongest iron waters I have seen. The site can be encountered on the drive to Buckhurst House and was clearly an estate improvement. However, beyond this I have been unable to find more information regarding its history or traditions and would welcome further information. A visit to Hastings will reward those interested in ancient wells as the town preserves a number of perhaps lesser known sites, many of which still flow and produce large quantities of water. 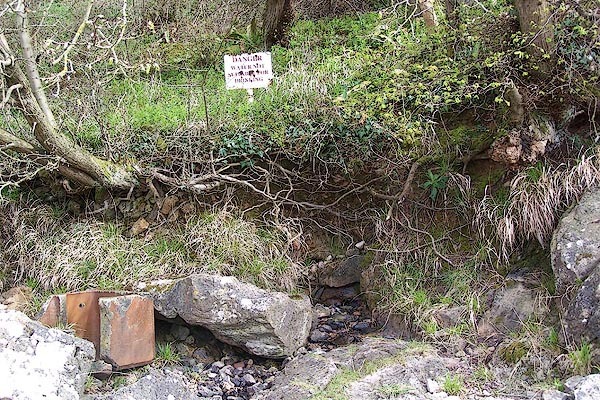 This is particularly true of the East Well, whose water can be sampled by a tap which produces its waters readily below a sign which reads ‘waste not want not!’ The water is enclosed in large conical conduit house sitting at the base of the East cliff railway at Rock a Nore. The East Well is situated next to the East Hill Lift and was built in the 1840’s with part of the money raised from a local fundraising campaign by Dr McCabe, more of him later. Nearby but presently inaccessible is the spring found in the crypt of St Marys in the Castle, which confusingly is not in the castle grounds but below in the old town. This is a sizable white edifice. This is unusual in an Anglican church as it is a tank for baptism by immersion. It dates from 1928 and is fed by one of the five springs found emerging from the cliff-face when the church was built. 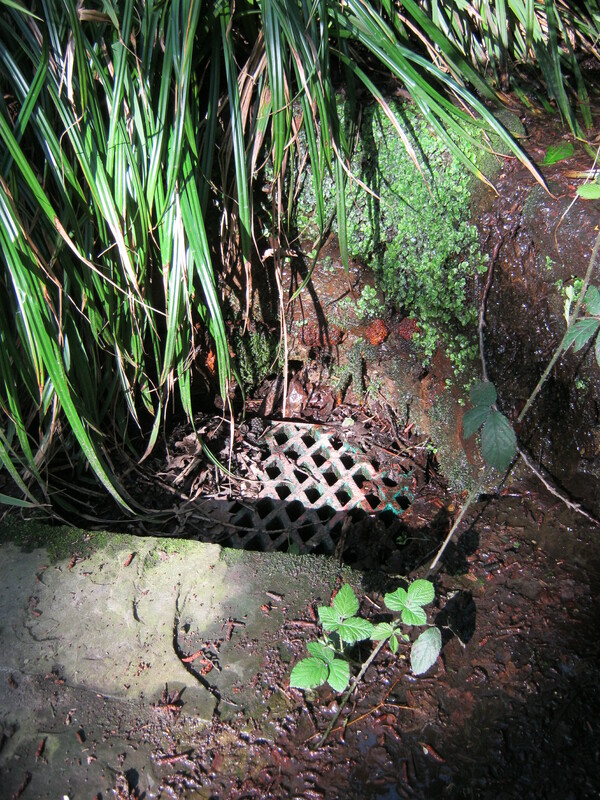 Despite an association with a local doctor does not appear to have been a medicinal spring, although it was was the most well known at the enclosure of the park perhaps because it was the most useful. 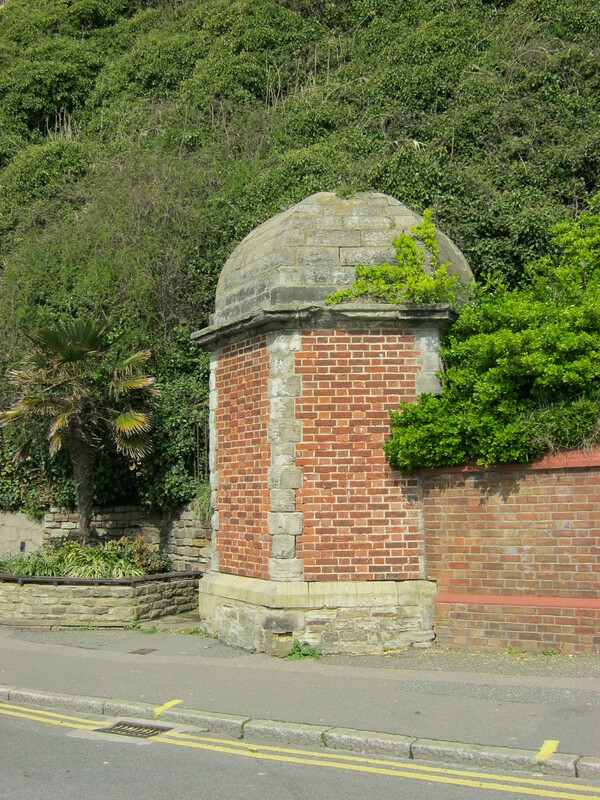 It seems likely that either of these spring was once the eponymous St Helen’s Well, which is arguably Hastings only holy well. This may be supported by a medieval settlement being located in the valley of the park perhaps. However, another site is claimed to be St. Helen’s and this is situated in the small area of park land behind the ruined church of the same name. Asking for the location of the site I was given a ‘it does exist…I think I know the site….but not telling you approach’ to helping. 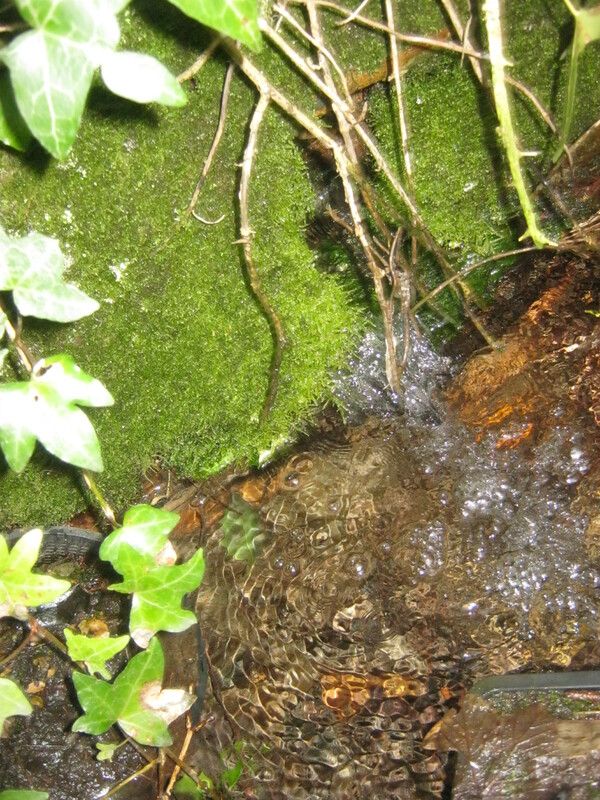 Despite this I did find what I would assume was the site, a mossy pool beside the lane. The final site is perhaps the least well known but more rewarding and impressive. 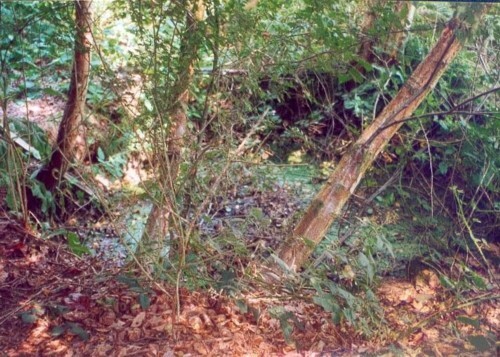 This is the Roman Bath, laying enclosed romantically in the wooded hillside below the Leisure centre on Bohemia road in what remains of the Summerfield estate. Despite what a leaflet distributed in Hastings in the early 20th century which offered 3d guided tours of what it claims was built in AD51 by King Caractus, it was certainly built by a Wastel Brisco who commishioned the building after obtaining the estate in 1831. The building is made of sandstone and some cement with a retaining wall of about 12 feet in height. At either side were steps, although those of the left are better preserved. These led to a viewing platform over the bath. The bath itself is a rectangular 15 feet by 8 feet sandstone pool with four or three worn cement steps gaining access to its debris strewn but clear waters. The spring which feeds the pool arises in a grotto and once through a lion’s head, now stolen into the pool. A Romanesque archway with colonettes covers this springhead which once had a lion’s head keystone and this is the most impressive of the remaining features. Early depictions show a circular structure with an arched entrance which may have been a changing room if the bath was of course used, or alternatively covered another spring as there is possible evidence of this where this was located. There does not appear to be any evidence of stone work from this structure, which indicates a degree of more organised vandalism of the site perhaps. The run off channel which carried the water to the stream below is exposed although early photos show it stone lined. 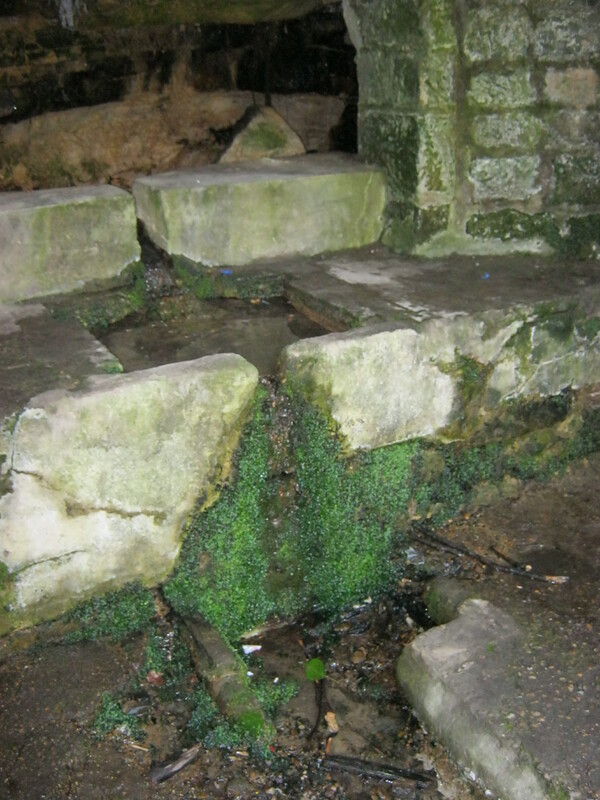 Hasting’s Roman Bath is without doubt the most impressive of the town’s water supplies and deserves to be known better. It is pleasing to see that there is local interest in preserving it and hopefully the vandalism which has gone on will now cease. 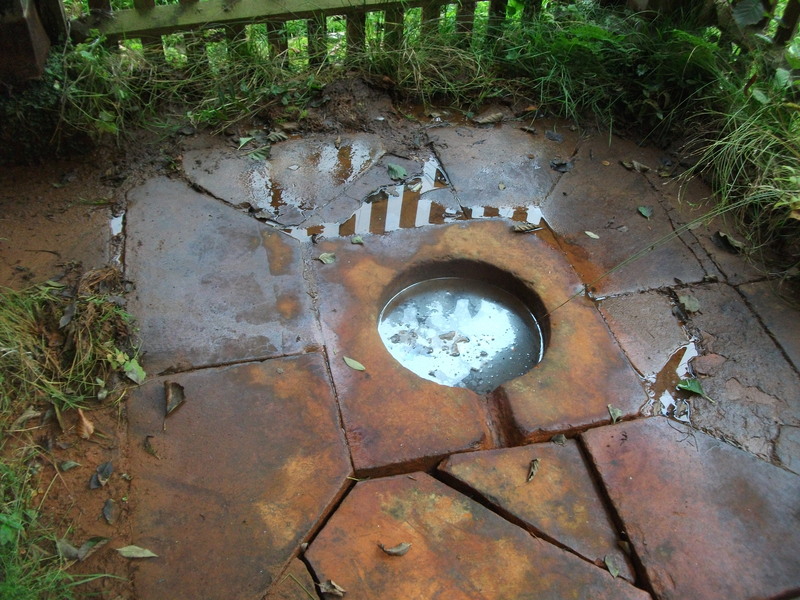 Sussex is not well known for its holy or healing wells, although close research will reveal a number. There is one particular site, which because of its location is of great interest. Fortunately, thanks to the present owners, Mr and Mrs Carroll, it was my great pleasure recently to be allowed access to examine one of East Sussex’s strangest sites. The Hermitage site has attracted considerable attention over the years, and became a ‘tourist attraction’ in the eighteenth and nineteenth centuries. In an extremely obscure work, produced for a Cecil De M. Caulfield Pratt by one Charles Dawson (n.d.), The history of the Hermitage at Buxted, Sussex, a full account is given of its history, as well as a number of Edwardian-style pictures of the estate. The caves are hewn from grey sandstone, lower Tunbridge Well Sands, indeed the type for which the pleasant spa town is most picturesquely famed. The extent of this sandstone is quite impressive, at 275 metres long, providing a long sharp vertical ridge to one side of the garden. The site has apparently a long history of habitation. Archaeological research by Jacobi and Tebutt (1981, pp.1-26) identified a Mesolithic site at the foot of the long outcrop, dating certainly from around five thousand years BC, and possibly even from the seventh millennium BC, making it one of the earliest sites in England. The site yielded a number of microliths, and it is theorised that it was used by male hunting parties (four thousand flints and two sandstone hearths were identified). At this time the area was presumably enclosed in the ancient Forest of Andred, which according to the Saxon Chronicle (Anon. 1993, p.114) covered much of Sussex. The caves, probably partly natural, certainly carved, have attracted considerable interest. They appear to have been a minor tourist attraction in the eighteenth century. Certainly they attracted artists and antiquarians. There are two drawings of the site in Gough’s Topographical Collections (Gough 1795, unpaginated). These were made on May 28th 1785, and are pencil and wash.
One of these illustrations shows the ‘Rocks at Buxted, called ‘The Vineyard’. This was because a plantation of vines was established here. Apparently they thrived, as the site was naturally quite sheltered. However, according to Alexander (1996, p.2), it was established in 1824, by a Mr Lidbetter, who trailed the vines over Smuggler’s Rock. The second is captioned, ‘Outside of the rock habitation of the Vineyard Rocks near Buxted, in Sussex, it is decidely of great antiquity. Traces of its having been a vineyard still remain.’ Other drawings of the site exist in the Burrell Collection at the British Museum. The site probably continued to attract visitors into the twentieth century. Indeed, an interesting source of information on the site is a small handwritten note, which was bizarrely found by an upholsterer in an old chair during its repair, and thoughtfully sent to the owner. One presumes it was written by a visitor to the site in the early twentieth century, and it makes some interesting points, which are not noted in other works. The date of the caves is unclear. 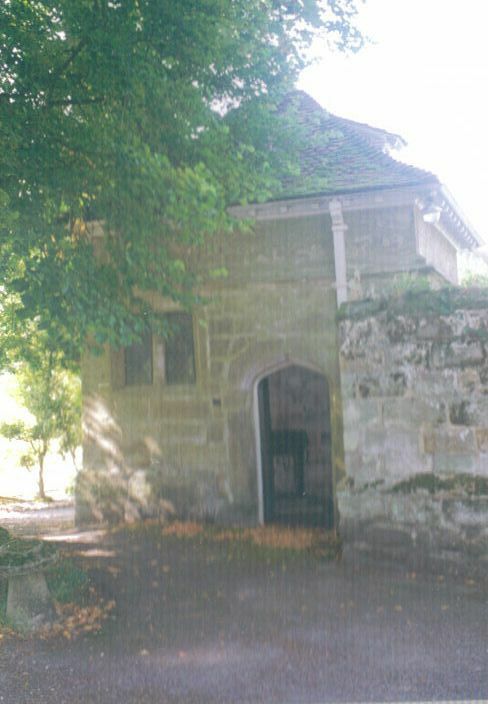 Grenville Cook (1960, p.16) suggests that the presence of the niche and pointed archway are signs that the Hermit who dwelt here may have lived later than the Norman times, since Norman arches were rounded, and the making of niches for images was not earlier so prevalent, especially in a Hermit’s ascetic dwelling. Furthermore, the presence of a fireplace is an interesting historical point, for such features were rarely rare in this period, and certainly missing from domestic architecture. This further indicates a late mediaeval date for the structure. Even so Grenville Cook notes that it ‘is considered to have been probably one of the first ever constructed at the side of an apartment’ (Grenville Cook 1960, p.16). There are mixed views regarding the fate of the Hermit. According to the present owner, Mrs Carroll, local belief asserts (Mrs Carroll, pers. comm.) that he was removed from the site and buried in consecrated ground. However, according to Dawson (n.d., p.9), the remains of a person were found in a niche (given the date 1915 on the note). This was whilst building operations were being carried out to erect the modern house by a Mr E. W. Streeter, a former owner. 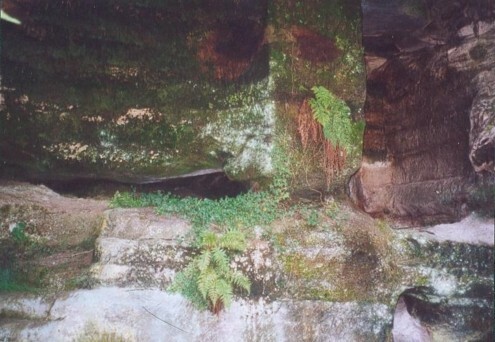 The niche was cut into the sand at the top of the rock, and according to Pratt it was still visible (although I fear that it now has become rather more overgrown). Indeed, it is suggested that this was the original function of the caves, and that perhaps the name ‘hermitage’ was a more romantic appellation. However, it would be unlikely that such a feat of work would have such a primary use, as a simple building often sufficed elsewhere. Naturally too smugglers have been connected to the site, although there association is to a piece of rock on the sandstone ridge some distance from the hermitage. This is called ‘Smuggler’s Rock’, where it has been suggested contraband was hidden. There is no evidence for this and the name may be a result of some tourist fabrication. The cave, according to Jacobi and Tebutt (1981, p.1) was probably last used for malting or as a hop oast. The house adjoining the cave is said to be ‘modern’, built in Edwardian times. It certainly has architectural features from this period, but I am of the view that rather than replacing one which completely burned down, it incorporated some of its remains. Certainly the roofs appear much older and Mrs Carroll informed me that it has old timbers. An Elizabethan date would appear suitable. However, little is known of any building on this site during this period. 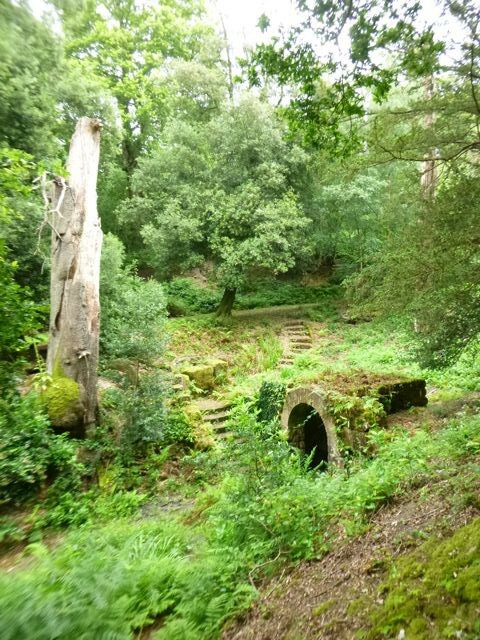 The caves were situated on land which was once part of Charity Farm at Buxted, which belonged to a Dr Saunders, (who founded the Grammar School there in 1718), but where his building was situated is unclear. Nevertheless this ‘modern’ house utilises the Hermitage, as a vestibule, well. One entrance to the house is reached through the caves, and the whole house is fitted snugly to the rock. A delightful octagonal room sits upon the caves’ roof and one presumes that its construction led to the skeleton’s discovery. ‘The well in the orchard in front (and north) of this cell. Half way down the orchard (also called the Vineyard) is the Wishing Well, ten feet in diameter…with steining of rough stone with a few blocks apparently worked, and a gap or opening on the east side, probably the former approach or “dipping place”’. The site is now considerably overgrown and lies in a small copse. Small saplings have encroached upon the edge of the well. Mrs Carroll now hopes to remove these. Worked stones can still be seen around the edge of the well, and she informed me that probing it revealed a stone bottom. Sadly, the contents are very murky and black. The spring water formed a marshy stream which ran down into the paddock, forming four pools. The Carrolls filled in three of these to allow for better drainage, but the furthest one remains. Mrs Carroll expressed the opinion that it would be interesting to clean out the well, but said such an enterprise would be a fair way off! However, in these days of rapid change it is pleasing to note that this most bizarre landscape remains for future generations. It must be stressed that The Hermitage and wishing well lie on private land, and uninvited guests are not welcomed. However, Mrs Carroll is proud of the estate she has acquired and hopes to open the site for future Garden Open Days. Anon. (n.d.). Note in the private collection of the Carrolls. Alexander, R. (1996). A short history of Buxted. Tunbridge Wells: Opax. Dawson, C. (n.d.). The history of the Hermitage at Buxted, Sussex, kindly written and compiled for Cecil De M. Caulfield Pratt, Esq. Privately published? Gough, R. (1795). Topographical Collections. London: Payne. Grenville Cook, A. (1960). A short history of the Parish of Buxted. Privately published. Hope, C. (1893). The legendary lore of the holy wells of England. London: Elliot Stock. Jacobi, R. M., and Tebbutt, C. F. (1981). ‘A late Mesolithic rock-shelter site at High Hurstwood, Sussex’. Sussex Archaeological Collections, 119, pp.1-36. Prince, C. L. (1896). ‘Notes and Queries No.1’. Sussex Archaeological Collections, 40, p.265. Turner, E. (1859). ‘Uckfield Past and Present’. Sussex Archaeological Collections, 12, pp.1-22. Please note that the ‘hermitage’ and spring are on private property and are not open to the public. Thanks to Mrs Carroll, the owner of the site, who also had in her possession a note on the site.